Glance at the menu at Boston’s Mei Mei, home to the Double Awesome scallion pancake sandwich and a Magical Kale Salad, and you immediately get the sense that the siblings who run the Chinese-American restaurant take a lighthearted approach. 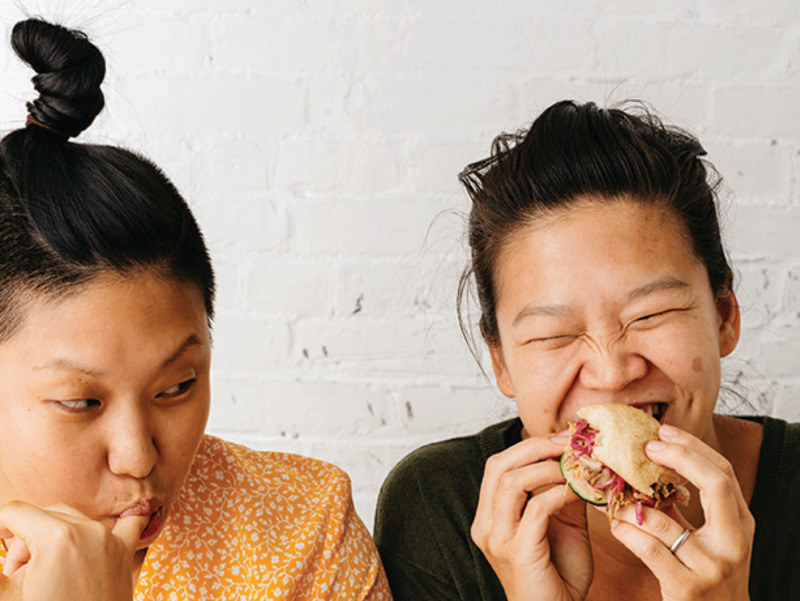 Behind the scenes though, sisters Irene and Margaret Li, who started the restaurant with their older brother, Andrew, in 2012, have long been serious about one thing: pioneering sustainable restaurant practices, and, as part of that, reducing food waste. If you were swinging by for lunch, you probably wouldn’t have known that the pesto on that Double Awesome was made from hole-riddled arugula a farmer had been having trouble selling, or that the salad was topped with fried butternut squash peel that otherwise would have been swiped into the trash. Early on, the chefs, like many of their root-to-stalk colleagues, realized that sustainable methods were good for more than their bottom line and the environment. Challenging themselves to use every last leaf and stem often resulted in more creative and flavorful dishes than what they would have come up with otherwise. Now, the Lis are using what they've learned to inspire home cooks. Adding to the ever-growing discussion of how we can stop throwing away so much food already, their new website, Food Waste Feast offers recipes, tips, and a forum to ask the chefs questions about reducing the amount of food that goes from the fridge to garbage can. As the conversation goes on, the sisters want to help make sure it extends beyond Instagram “likes” and provocative documentaries and into real change on both a personal and national scale. Inspired? Follow their tips below, and keep an eye out for the siblings’ forthcoming first cookbook, Double Awesome Chinese Food: Irresistible and Totally Achievable Recipes from Our Chinese-American Kitchen, which hits store shelves in February and includes additional suggestions for reducing food waste. “Grocery stores are filled with airbrushed produce,” says Irene. Meanwhile, bruised or misshapen fruits and vegetables are often shunned but are typically just as good to eat as their blemish-free counterparts (all you have to do is cut out the bad spots). The sisters suggest making a point to ask for second-quality produce from grocery store managers and farmers’ market vendors, who will often sell it at a discount, to help shift the cultural norm, make more fresh food available to those on a budget, and reduce the pounds of produce going into the trash. Sometimes we end up throwing things away simply because we aren’t sure how old they are, and don’t want to take a chance. A simple solution: Use a piece of tape and a permanent marker to mark all food containers with the date the item was made or bought. (It's a common practice in restaurants. so you’ll never have to guess again.) This is especially useful for keeping track of things in large or shared households. Take it a step further by putting items that need to be used first at eye-level in the fridge. Toss unwanted vegetable pieces such as mushroom stems, onion skins and carrot peels into a large freezer bag. When it’s filled, add the scraps to a pot with water, simmer for about 30 minutes, and you’ll have fresh vegetable stock. Margaret also applies the same concept to fruit, freezing nearly overripe bananas and half-eaten apples that she later blends into smoothies for her young daughter. “I get so excited because it feels like it’s free,” she adds. Meaning, don’t be afraid to tweak a recipe if it helps you use something you already have in your house. Got an extra cup of broccoli? Throw it in. Have kale but not the spinach the recipe calls for? That will probably work just as well. And it might make the dish taste better, but consider whether you really need to buy that whole a bunch of fresh parsley if the recipe only calls for one tablespoon. If you’re likely to throw the rest away, dried herbs might be a better bet. A stocked fridge can be a wonderful thing, but unless you are organized, it can be easy to forget about what you bought on Sunday by the time Friday rolls around. Therefore, if possible, make more frequent trips to buy just what you need for the next day or two. If that’s not an option, factor in realistic interruptions to the your regular eat-at-home schedule, such as the chance that you may get invited to a dinner or pick up take-out one night. “We want people to learn to to trust their own sensitivity about what’s too old to eat and what isn’t,” Irene says. And it’s important to remember that once something hits a “best buy ” or “sell by” date, it doesn’t necessarily mean it’s not okay to eat. The best judge? Simply stick your nose in. “Especially with meats like chicken or pork, if it’s not good, it’ll tell you,” she adds.